My favorite places at Rutland County Humane Society (RCHS) are the cat rooms. I truly enjoy watching the comings and goings, the different personalities, and the fights and love fests as boundaries are tested and friends are made. Offering Reiki in a room with many cats can be challenging with these distractions and it is important to maintain focus during a session. 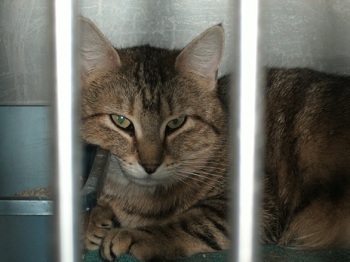 Before cats get to the cat room at RCHS they are held in kennels in the intake room. Here they are kept from the general population as their health is checked out or they await spay/neuter appointments. The cats in this room are both surrenders and strays. Usually, there is a mix with a maximum of about 15 cats. Cats are in varying degrees of stress in this room; many times they are hiding in a box or behind a towel draped over the front of the cage. As much as I enjoy the cat rooms with their freedom to move around, I love offering Reiki in the intake room! Often, these cats are very frightened and Reiki is very soothing for them. It is also soothing for me. I find that I can go to a deeper place in this room as I don’t have cats jumping on and off my lap or worse–a cat fight! Recently, I sat in the intake room. All the kennels were full. One had a towel over the door and I couldn’t see inside. One kennel had a box which appeared to hold a cat. Several cats were meowing and moving around in agitation. One was pushing against the cage front creating a loud rattling noise. I like to visit each cat individually to say hello if they aren’t shy. After doing that, I sat on the other side of the room and began breathing deeply. When I felt centered, I spoke quietly without looking directly at any of the cats. After letting them know what I was up to and telling them they didn’t have to participate, I began. Almost immediately, the room began to settle down. I waited a bit and then checked in discreetly. Some cats had gone to the back of their kennel; some came up front and were staring at me; others were dozing. The sound of many cats purring has a sedative effect on me and I found myself going deeper into my meditation. After about twenty minutes I looked up. I could see two cats were behind the towel. They were peeking around the edge. I could see one eye and one ear on each! Next door, the cat from the box had come out and was eating! Most likely, I will meet these cats again in the general population. Often, cats who received Reiki in intake come right over and jump in my lap in the cat room.